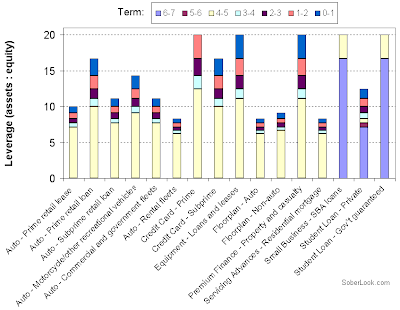 Small business loans and government guaranteed student loans have only two leverage categories - less than 5 years and greater than 5 years. All other assets have the full spectrum of maturities vs. leverage. The chart below shows that as maturities get shorter, an investor can get incrementally more leverage. Each maturity bucket (term- in years) is shown as a different color. We show TALF CMBS leverage separately, since it's almost a separate program. 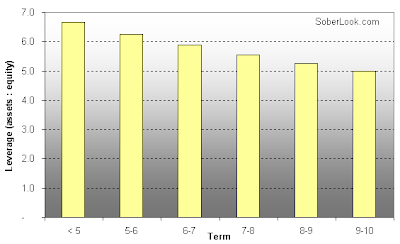 Maximum leverage on CMBS is 6.7 times. Note that on "legacy" CMBS, the leverage is smaller, since the paper is valued below par. So for a senior note that trades at 75c on the dollar, the leverage would be 75% of what's shown in the chart above.